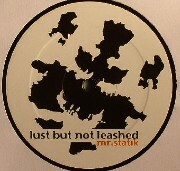 Mr. Statik is already a constant in the field of electronic music with dozens of releases on labels like Bpitch Control, Karloff, Stock5 and Octopus and remixes for various artists. Now, he has produced his first 12“ record for Mo’s Ferry. Not the casual House – and this is not just another DJ tool, but rather a multifaceted record with a B-side that shouldn’t be left cuddling with your slipmat all the time… even though it’s hard not to put the needle right back to the beginning of the A-side. Listening to „Come On People“ you could tell immediately that Breakbeat is one of Mr. Statik’s various roots. Short drumloop slices inconspicuosly stacked with the driving hihat give this merrily jumping House track a special touch. The British sound of the Greek producer is formed by an extraordinary symbiosis of House elements, funky guitar licks and a slightly dubby atmosphere. Without even thinking of picking conventional and worn cheesy stuff to express lightness and happiness, this track does it in a very natural way. The B-side as the logical consequence extends the suspense heading to the afterhour. Referring to the 90s the sound aesthetic is primarly formed by samples. The typical Drum’n'Bass-pad emphasizes the whole concept. A varied bassline and selective talkbox-vocals take „Workin’ It Like We Do“ to a higher dimension. Marking the ending oft the suspense, the last track captures you in a different way. Jazzy drums, a piano and skillfully used reverberation make it a trippy closing piece for our travel through Mr. Statik’s world. - "Workin' It Like We Do"
Mehr von Mo s Ferry Prod.